First off, I would like to say that I dedicate this post to one of my country’s most appreciated and loved hero of the moment, Dato’ Lee Chong Wei. He is a well-established, World Number One Badminton player in the category of Men’s Singles. He has managed to achieve many championship titles in the world of Badminton. A gold medalist in the Commonwealth Games and Asian Championship. However there is one very important title he has yet to claim that he may not be able to achieve anymore, and that is the Olympics Gold Medal. Why he hasn’t been able to clench that title? It’s because he has a very tough, determined and strong opponent which is Lin Dan from China. The history between these two top players are that out of so many matches between them, Chong Wei has only managed to win Lin Dan a total of 9 times whereas Lin Dan has won a staggering 22 times. This Olympics meet-up was their 30th match against each other. On the 5th of August, I would say that almost all of Malaysia stopped their daily routines just to tune into this very match at 8:00pm sharp. Many of us had our dinners early and cleared our calendars just so we would catch this game. I sat in front of the television with my phone in hand, live tweeting with my friends and to show support to my favourite Badminton player. Lo and behold, Chong Wei won the first round with a score of 21-15 which I find very impressive for a game starter. Twitter was flooded with congratulatory messages and good luck posts. The second game kicked off and we finally see the ropes of Lin Dan. I noticed he may be desperate and starting attacking poor Chong Wei smash after smash and Lin Dan won the second round with a score of 21-10. It was a truly a big blow to us Malaysians. The third game went into action and I say that this round was the BEST MATCH I HAVE EVER WATCHED. With one win to each player, it was anyone’s game on who would win this. Plus, the scores were neck-at-neck (7-7, 7-8, 8-8, 8-9, 9-9,…). Lin Dan was leading towards the end, then Chong Wei managed to catch up at 19-19. I was on the edge of my seat at this point. Finally, Lin Dan gained two points and that was it… I was so stunned because I had all the hope in the world that our Lee Chong Wei would finally achieve that gold medal. Malaysia’s first ever GOLDmedal in the history of Olympics for Badminton. We saw him fall to his knees right after the last score with his coaches consoling him. His disappointment touched us all and made us tear. All in all, it was a VERY GOOD game. The best I’ve ever watched. By the way, I do NOT accuse Chong Wei for not getting the gold. However, I would like to congratulate him for a well-played game. I would say that this has to be one of his best games played. What breaks my heart is that Chong Wei actually tweeted “I’m sorry” half an hour after the game. 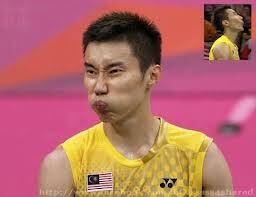 Don’t you ever be sorry, Chong Wei! You have united the whole country in ONE night and gave us a shiny silver medal. The medal doesn’t matter, it’s you that matters. Don’t you be sorry. The Olympics should be sorry for not having you as a Gold Medalist. 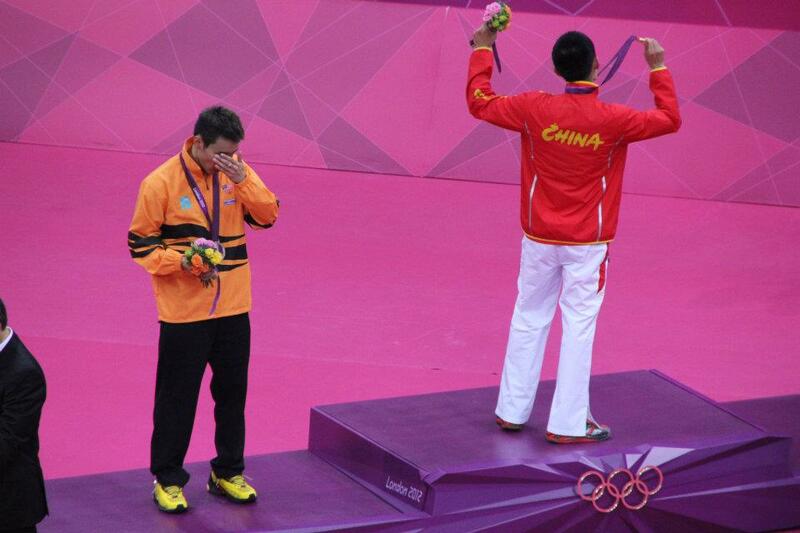 At the medal award ceremony while Lin Dan celebrated on the podium, a very heart-wrenching moment was captured. Chong Wei held his head so low and was seen tearing. I really felt it, and my eyes were starting to get watery. Behind the glorious curtain of Lin Dan, lies a heartfelt moment for us Malaysians. 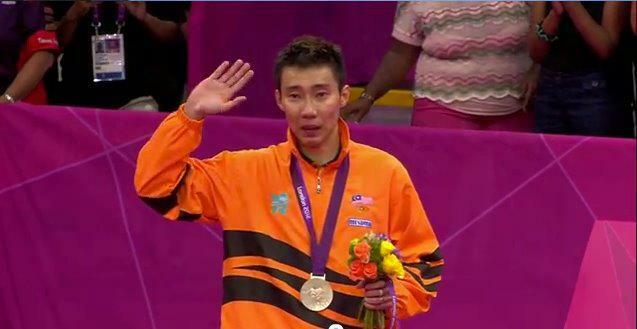 Lee Chong Wei gave all he could and we still love him no matter what. Lin Dan has been known to be arrogant when he plays. After winning titles, he gladly rips off his shirt and runs around the court. I would like to quote this from an ESPN commentator during the game “Skills wins you medals but attitude wins heart”. And you, Chong Wei, has won the hearts of Malaysians. A caught-in-the-moment shot of LCW being cheeky!